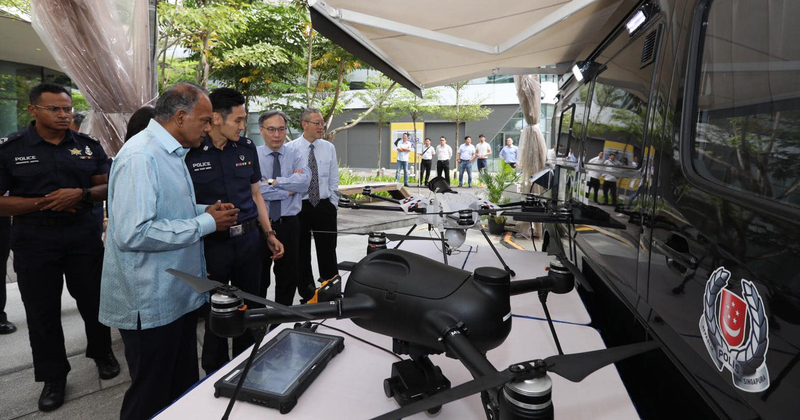 The Singapore Police Force (SPF) announced at its annual Police Workplan Seminar that it will launch a fleet of drone-equipped vehicles. Called the Sky Aerial Response Commend (Sky ARC), the vehicles will carry up to three drones and are operated by a 10-man SPF UAV unit. The drones can be used both indoors and outdoors, and can fly for as long as 40 minutes, up to heights of a few hundred metres above ground level. They can even be used to fly near a unit in a high-rise building, and capture whatever is happening as a live video which can be then streamed back to the Police Operations Command Centre. These vehicles will be used for pre-planned security events, search missions, and situations requiring aerial surveillance. Minister of Home Affairs K Shanmugam, who was the Guest of Honour at the Seminar, said that one key area that the SPF will focus on is “defending the country’s social cohesion, particularly in the areas of racial and religious harmony”. The Sky ARC is part of a one-year long pilot programme where the SPF rolling out high-tech law enforcement measures to enhance its operational effectiveness and become a “smart force”. During the Seminar, the SPF also revealed that they are “exploring” the use of wearable technology like smart glasses. These smart glasses will be equipped with facial recognition technology, and is also able to do real-time video analytics. In line with Minister Shanmugam’s speech at the event, where he pointed out that the police “must continue to protect the vulnerable in Singapore’s society”, SPF also introduced a miniature humanoid robot named Mini Autonomous School Talk Robot Officer (Mi-ASTRO), which will act as an “icebreaker between officers and kids”. About the size of a water bottle, the Mi-ASTRO is programmed with customised messages on police information and safety tips for children. To attract the attention of kids, the robot’s eyes can also light up in different colours and perform tricks like somersaults and handstands. Mi-ASTRO has already been trialled at three PAP Community Foundation (PCF) pre-schools, and SPF hopes to eventually equip it with a translator to communicate with the elderly. The SPF is also exploring 2 new systems to enhance police defence tactics and marksmanship training with technology. The Impact Measurement Trainer will provide immediate feedback to trainees practicing on a mannequin by displaying information like the strength and location of each strike on a screen. An Enhanced Live Firing Range System is also being co-developed with the Science & Technology Group, and will provide real-time recommendations to help officers improve their shooting by analysing factors like weapon handling, breathing, and posture. Finally, a one-stop screening platform called Jarvis, developed with government agencies GovTech, will allow investigation officers make faster and better searches across multiple police databases with a single query. A screening on Jarvis will take up to 5 minutes, as compared to the usual 20 minutes.